Janney’s Noah Doyle, Senior Vice President/Wealth Management, and Charles Princiotto, Vice President/Wealth Management, are putting their mark on the business as next generation advisors through offering clients diverse skill sets, incorporating the benefits of teaming into their practices, and participating in and building on Janney’s culture of excellence. Noah, who is also an attorney, believes that his diverse educational background and experience allow him to add value to his client relationships. As both a financial advisor and a lawyer, he is able to provide clients with expert advice on important decisions such as estate planning. Charles, who is a Certified Financial Planner™ and Accredited Investment Fiduciary®, brings a strong background of comprehensive financial planning and helping clients to invest wisely to maximize their finances and support their goals – whether it’s sending a child to college or reaching retirement goals. 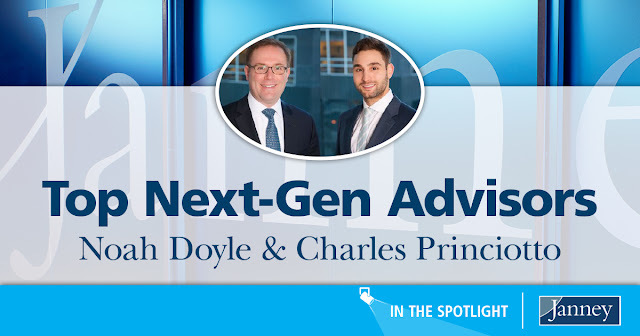 Noah and Charles, who work as part of Janney’s Battery Park Financial Partners group based in New York City, extoll the benefits of being part of a team, noting that it has benefited both them and their clients. Noah said, “The benefits of teaming are great. It’s impossible to do it all – to serve clients, find new clients, do research, stay up-to-date with compliance regulations – without a team. Through teaming, we are able to learn from each other and everyone serves a different role. The outcome is always better for the client when there are more skill sets and resources to tap into,” said Charles.